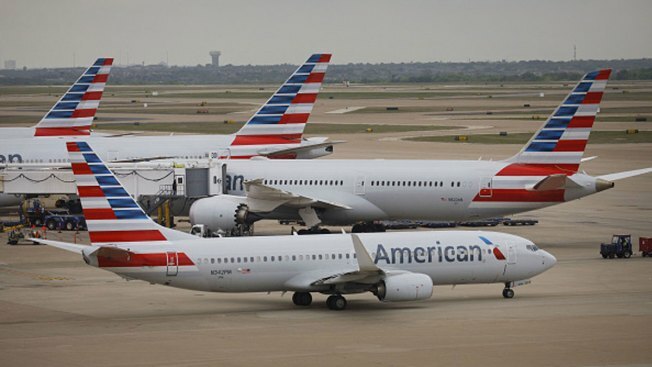 American Airlines Group Inc. planes stand at Dallas-Fort Worth International Airport (DFW) in Grapevine, Texas, U.S., on Friday, April 6, 2018. American Airlines says a passenger's electronic cigarette caused a small fire on a flight from Las Vegas to Chicago's O'Hare International Airport. American Airlines spokeswoman Leslie Scott says the e-cigarette's battery overheated shortly after Flight 168 landed Friday night. Scott says flight attendants stamped out the fire.